The city of Memphis holds a special place in the history of Ancient Egypt and is believed to be Egypt’s oldest capital. Galina Belova, the head of a Russian archeological expedition in Egypt explains that scientists are now finishing excavations on the site and will search for other parts of the wall in the coming days. 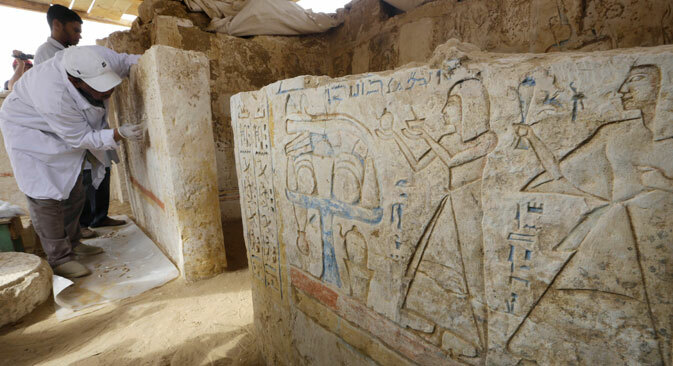 A team of Russian archeologists working in Saqqara near Cairo has discovered the remains of the so-called "White Walls" from the ancient Egyptian capital Memphis. In Ancient Egyptian these walls were called Inbu-Hedj. According to Egyptian Antiquities Minister Mamdouh al-Damati, the finding of the great historic site was made near the town of Mit Rahina, 12 miles south of Cairo near Saqqara, which was the necropolis of Memphis. In addition to the parts of the wall, the well-preserved remains of stoves and materials made of bronze were found. Belova explains that scientists are currently completing excavations on the site and will search for other parts of the wall in the coming weeks. She also expressed hope that "other archeological witnesses of this early period of Ancient Egypt’s history dating back to nearly 3200 B.C." will be discovered. The Egyptian authorities are making efforts to maintain free and secure conditions for the Russian archeologists at the site. The tourist police and Giza security office have boosted security measures and the local administration has helped clear the excavation site of contemporary structures. Memphis holds a special place in the history of Ancient Egypt and is believed to the oldest capital of Egypt. The city was founded more than 5,200 years ago by the pharaoh Menes. Memphis was capital of Egypt during the period of the Old Kingdom and it has been listed as a UNESCO World Heritage Site since 1979. Located south of Cairo, Saqqara and Mit Rahina have already delivered several important archeological findings. Among them are the stepped pyramid of Djoser and the famous statue of Ramses. Meanwhile, Egyptian and foreign archeological teams will continue their work in the area in a bid to uncover new and unique artifacts.